The WWE is doing a great job of letting Paul Heyman celebrate Brock Lesnar’s win over The Undertaker, thus ending “The Streak” at WrestleMania. But in my opinion, the win now seems hollow on so many levels – mainly because the Dead Man is not television following the loss and because Lesnar himself is not on screen each week to celebrate his “win.” The fact is the WWE does not have anyone on the roster right now to challenge the “Beast” on a weekly basis and while Kane is busy trying to destroy Daniel Bryan, the likelihood of Lesnar getting a shot at the WWE World Title isn’t very good right now. 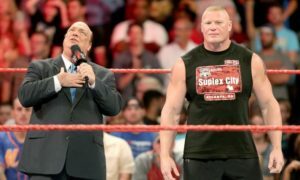 With some buildup and strategic planning, Lesnar and Bryan may meet in the future with the title on the line – thus allowing Lesnar to win the title and create booking nightmare for the company. It is more likely that Heyman’s other associate, Cesaro would get a crack at the belt before the big man because for business, a match between Bryan and Cesaro is more entertaining to the WWE fans. While Lesnar being champion is a move most of the WWE Universe can get around, watching a match between Lesnar and Bryan may be very painful. Am I the only one who thought the idea of Brie Bella winning the Diva’s Title on Monday night made too much sense? Raw was explosively good on Monday night, but the writers and management got it wrong. Tamina Snuka is supposed to face the Diva’s Champion at Extreme Rules. Paige currently holds the belt and is a neophyte in terms of ring experience. Snuka is the “Amazon” of the division. The current storyline of the Bryans vs. the McMahons gains more steam if both Daniel Bryan Bella have the top two titles in the company. The match between Paige and Bella that was interrupted by Kane is a tried and true way to keep the feud between the Big Red Monster and Bryan fresh and hot – but it did nothing to help promote the match between Snuka and whoever the Divas champion is going into Extreme Rules. One of the great parts of the WWE since the end of last year has been the reunion of the Rhodes family – Cody and Goldust and their reign as World Tag Team Champions. Recently – as the storyline dictates – the love between brothers has come to a halt of sorts with losses in the past two weeks that Goldust has cost the duo. While it is slowly tearing apart the tag team, it is creating potential excitement for the WWE Universe. This rivalry is one that has been teased for some time now, dating back to the Royal Rumble in 2013 when both men beat on each other for about five minutes in the ring. Goldust has always been a fan favorite even as a heel. Cody Rhodes won the support of fans when he left Damien Sandow in the dust following their rivalry after Money in the Bank. The two probably will not face each other at Extreme Rules, but SummerSlam is a real possibility. And finally, now that Wade Barrett is the top contender for the Intercontinental Title – what happens if the Brit wins the match at Extreme Rules over Big E? Personally, I love the match and the opponents. Big E is a great transitional champion – making Barrett the perfect storm to capture glory. But if Barrett does win, does it mean he will garner attention as having the second biggest title in the company and that he should get a crack at Bryan and the WWE World Title?